The American Geophysical Union (AGU) represents 60,000 members in over 130 countries, but nowhere is its work to advance the Earth and space sciences more visible than at the organization’s headquarters near DuPont Circle in Washington, DC. AGU began a renovation of its building this spring to update equipment and materials in its 25-year-old building. When reviewing options, AGU’s leadership decided that they needed to develop a 21st-century workspace that reflected the mission of their organization. They wanted to utilize the technologies and flexibility that would foster a healthy and productive work environment, but also demonstrate the role buildings can play in reducing carbon emissions that are driving climate change. Buildings are responsible for roughly 40% of carbon emission in the United States, according to U.S. Department of Energy estimates. Efforts at the beginning of the planning process to bring together the engineer, contractor, owner and city representatives, as well as neighborhood groups and AGU members were critical to achieving the project goals, McEntee explains. “Even when things have gotten challenging, everyone could realign to the goals we initially set,” she said . 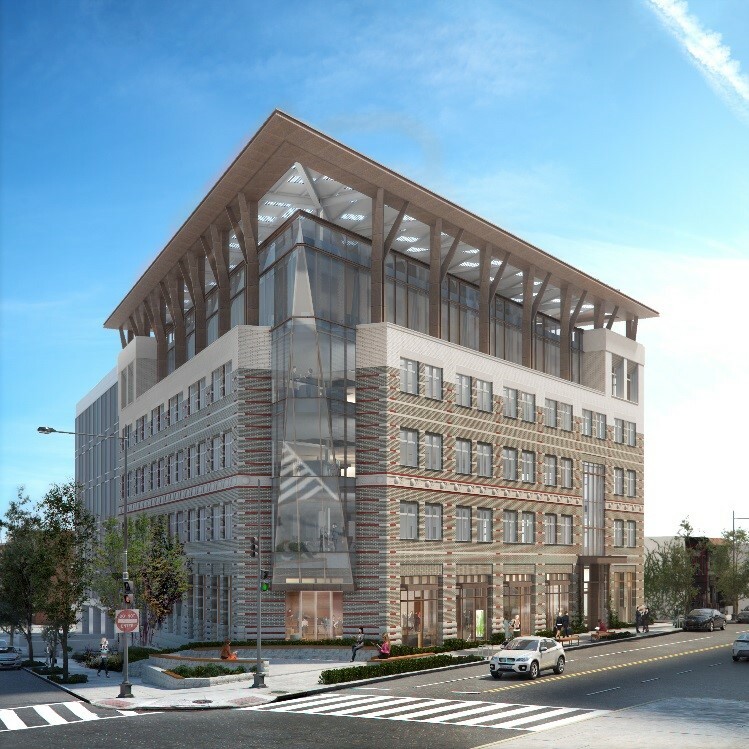 To achieve net-zero, the AGU engineering and construction team developed a plan of design and technology options that would reduce energy use in the building systems from its baseline energy use intensity (EUI) of 90 kBtu per square foot per year. Typical EUIs for NZE buildings range from 18 to 25 kBtu/sf/year, according to NBI research, although AGU’s 60,000-square-foot facility is larger than most. In all, they identified 24 major energy efficiency and energy generation strategies, that would work together to get the building’s energy consumption to a level that could be offset with onsite renewable energy sources. The target is set at an EUI of 18 with a rooftop solar photovoltaic (PV) array generating enough energy to meet all its energy demand. Efficiency strategies for the building include off-the-shelf technology like enhanced insulation, radiant ceiling cooling, LED lighting, but also some new technologies and applications. The building’s windows will be triple-paned, high-efficiency with electro-chromatic dynamic glazing—reducing solar heat gain by self-tinting based on the level of sunlight hitting the building. The office lighting will be on a direct current system, avoiding energy efficiency losses associated with AC-to-DC conversion and allowing the building’s solar array to directly power the lighting. The AGU building will also use hydroponic phytoremediation to create a “living wall.” This large planting installation will help reduce heat loss in winter and absorb some heat gain in summer, and will also help purify indoor air. Most unique is the project’s municipal sewer heat exchange system, which has not been used before in the U.S., but is proven in Europe. This system recovers thermal energy from wastewater running through sewer lines beneath the building. Diverted wastewater is stored in a settling tank and then circulated inside the building to an exchange system that will extract energy from the water for heating and cooling before the water is returned to the sanitary sewer system. During periods of the year when the sewer temperatures are cool, the building’s radiant cooling system will operate in “free cooling” mode using the water from the sewer heat exchange system allowing the building’s chiller to be turned off. This eliminates the need for a cooling tower on the roof, and a substantial quantity of fresh potable water is saved.